The Food and Agriculture Organization of the United Nations (FAO), the Central American Agricultural Council of the Central American Integration System (CAC/SICA), UN Women, Mercosur’s Specialized Meeting on Family Farming (REAF), Brazil’s Special Secretariat for Family Farming and Agricultural Development (SEAD), as well as Uruguay’s General Directorate of Rural Development in the Ministry of Livestock, Agriculture and Fisheries (DGDR/MGAP), are the organizing entities of the campaign #RuralWomen, women with rights. 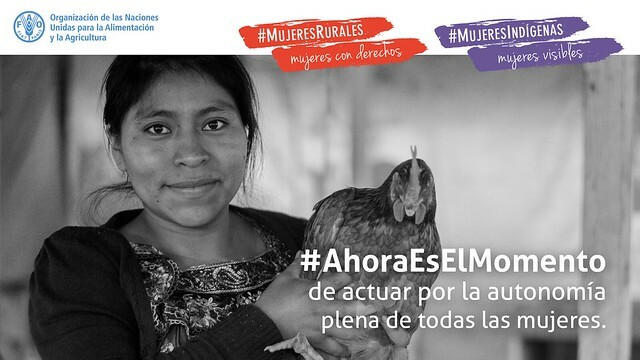 #RuralWomen, women with rights is based on the recommendations of the XIII Regional Conference on Rural Women in Latin America and the Caribbean, the Sustainable Development Goals, and the experiences of national campaigns held in Brazil and Argentina in 2015, as well as regional campaigns in 2016 and 2017. The 2018 version of the campaign runs from March to December, promoting actions on social networks (online) and in rural territories and spaces for policy dialogue (offline). The online component of the campaign will facilitate the sharing of achievements, challenges and priorities of governments, civil society, academia and the private sector, regarding the current situation of rural, indigenous and Afro-descendant women. It will also help to create collaborative networks and give women themselves a voice. In addition, in line with the campaign's open-source approach, any initiative related to the empowerment of rural women can join and create their own content and materials according to their local contexts. The campaign will also seek to create effective mechanisms for the participation of rural women and their organizations at the territorial level, as well as in national discussion forums and international spaces for policy dialogue. Through its offline component, the campaign will seek to support instances of political advocacy so that the countries of the region prioritize gender equality as an important element in their strategies for sustainable rural development. Although rural women have a significant participation in local economies, their work is often overlooked in national agricultural censuses and surveys, as well as in their own communities. In addition, women are burdened with a double workload, as they are often responsible for unpaid work such as educating children, caring for small children and the elderly, preparing food or collecting water and firewood. One of the main problems in this regard is the lack of autonomy of most rural women: they are vulnerable to violence; they have lower access to land, productive resources and training that would allow them to earn an income; and they lack of political autonomy to participate in making decisions that affect their lives and communities. In the case of indigenous women and rural Afro-descendants, the situation is particularly unfair. According to FAO estimates (2011) , if women in rural areas had the same access as men to land, technology, financial services, education and markets, agricultural production could be increased and the number of hungry people in the world reduced by between 100 million and 150 million. Latin American and Caribbean countries are challenged to reduce the gender gaps in the rural world and to consider all women as strategic allies towards zero hunger and sustainable rural development.